Late last year I discovered that I could enrol my business (Canada) in a Private Health Services Plan and reduce the amount of income tax I was paying. I’m not a big company. Essentially, it’s just me on the payroll. Although I’ve been a small business owner for five plus years, I had no idea that setting up a Private Health Services Plan (PHSP) for me and my spouse, or even just me, was possible. Neither did I know that setting one up would be a tax deductible expense for my business that could result in me paying less taxes. Enter my good friend and Graphic Designer, Jenny Stapler. Jenny runs a small business herself, Avenue Media. Although my husband’s Extended Health Plan, through his work, covers 50% of larger item dental expenses like crowns and such, the remaining amount comes out of our own pockets. Thus, late 2015 we were paying $1300, followed by another $1300 in early 2016. When Jenny mentioned that I could set up a Private Health Services Plan for my business and then write-off the medical expenses as a business expense (there’s a process), I was floored. But, because I trust Jenny and know she thoroughly checks things out before she signs up, I made the call to Brock Health, the PHSP she uses, and enrolled my small business with a Private Health Services Plan. The enrolment happened just days before the end of 2015, allowing me an additional tax deduction of roughly $1465 ($1300 for dental, $100 for one-time PHSP set up fee, $65 administration fee) against my business income, lowering my taxable business income by that amount for 2015. Health expenses are submitted with a claim for reimbursement to the PHSP by the individual incurring the expenses. These expenses may have been incurred by the business owner, their spouse and/or their children, the persons registered for the PHSP. The funds needed to reimburse the claimant are provided by the business. They are forwarded online or by cheque, or deducted automatically from an authorized business account, to the PHSP to provide reimbursement for the expense claim submitted. The expense claim is then reimbursed by the PHSP to the claimant (the business owner, their spouse and/or their children), using the funds provided by the business. A tax deductible receipt for the amount reimbursed plus the administration fee is issued to the business for claiming as a business expense. * Each company that offers Private Health Services Plans is different so be sure to check fees, services, turn around fees, reputation, etc. before enrolling with a particular company. A Private Health Services Plan (PHSP) is for small and medium sized businesses to provide superior employee benefits through a health and dental plan with a modest flat 5% fee. The owners and their employees receive comprehensive medical coverage while enjoying substantial tax savings. A PHSP is a low-cost alternative to health and dental coverage under a monthly-premium based Insured Plan. Incorporated businesses, including contractors, consultants, tradesmen, and professional corporations all qualify for medical benefits under a PHSPs. The business funds the entire cost of the PHSP health and dental plan and claims a corresponding 100% tax deduction. Meanwhile, Canada Revenue Agency (CRA) allows reimbursements to employees under a PHSP as non-taxable employee benefits (except in Quebec). The cost is a fixed percentage of the PHSP claim so you know exactly how much you are paying for your medical benefits. The Covered Services eligible under a PHSP are more comprehensive than most Insured Plans. They include almost every health and dental plan service provided by registered health care practitioners. See What is Covered for details. This category of businesses would include sole proprietors, self-employed, and contractors, as well as incorporated consultants, tradesmen, and professional corporations. This size of business enjoys the greatest tax advantage with a PHSP. Since your family will incur these health and dental expenses regardless, you will now enjoy a 100% tax deduction for your family medical benefits. Every established business in this category should have a PHSP for self-employed benefits. For the average family in Canada, the annual medical expenses can easily amount to $2000. A typical, healthy, family may only need to have a visit to the dentist for each family member, a pair of glasses, and a few prescription drugs to reach that amount. 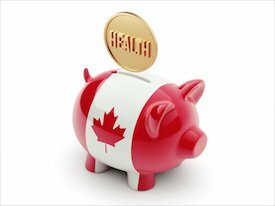 Depending on your personal tax rate and province of residence, your savings with a Brock Health Administration Private Health Services Plan (PHSP) can range from $350 to $850. Make your family health and dental expenses 100% deductible. Reduce your business and personal taxes. Get comprehensive medical coverage of all the routine expenses with few limits. Pay less than you do today in premiums for an insured health and dental coverage. Supplement plans held by a spouse who is employed outside your business. These businesses would include sole proprietorships or corporations that have employees who are non-family members. Now, your health and dental coverage is a cost right off the bottom line, so you are looking at cost versus value. You want to minimize your health and dental plan liability and still maximize the net staffing results for your employee benefits. Freeze your medical benefits costs permanently at a dollar amount your business can afford. You can budget and forecast with certainty because your health and dental coverage costs will never change until you want to increase or decrease them. If you prefer the catastrophic medical benefits offered by Insured Plans, a PHSP can cover all those little ineligible expenses under your Insured Plan. Your employees will love you for it. This category of businesses would include those who have now grown to a dozen or more employees. While still enjoying the tax advantages and employee benefits of the previous categories, you could now be faced with privacy concerns and the workload of your administrative staff responsible for submission of health and dental plan claims. Brock Health can help with no additional charges. We offer several options for prepaid plans to handle the additional administration for the same low fee. Your employees can submit claims directly to Brock Health for reimbursement. Funding of the plan can be tailored to fit your cash flow requirements. Reporting can be as frequent as you need. Your PHSP can operate as a low cost top-up to cover gaps in the medical coverage under any other plans you might carry. Brock Health Administration offers one of the lowest cost PHSP health and dental plans in Canada. We are based in Alberta and we are assisting over 3000 customers in every province and territory from Newfoundland & Labrador to British Columbia. If you own a business, regardless of whether it is incorporated or not, you can start saving money now. Ask your accountant or HR advisor about a Private Health Services Plan (PHSP) and register today. Sidebar: My conversation with Jenny points to the power of word-of-mouth advertising. When she spoke, I listened. I trusted that she knew the facts, based on what I knew about her. I trusted her recommendation and the information she shared about the benefits of a Private Health Plan. (I’m glad I did!) What people have to say about us and our business carries weight.